Available As 525/557/572 Same Price! 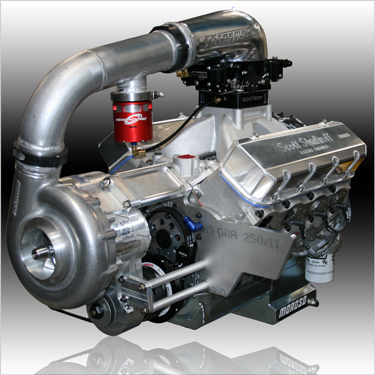 Mike Lubniewski, A Local Stand Out Bracket Racer From Division 1 Wanted To Step Up His Game Into Top Sportsman And Came To Us For A Low Maintenance, Consistant And Reliable Engine To Deliver The 2200+HP He Needed. Our Aluminum 540 F1X Procharger Engine Along With A Select Performance 2 Speed Turbo 400 Transmission Gave Him Everything He Needed. On His First Venture Into Competition He Traveled And Raced By Himself (No Crew) And Won The Race Running 6.72 @ 213 mph. Two Weeks Later He Ran The Dutch Classic At Maple Grove And Was Low Qualifier And Runner-Up'd (Broke Out In The Final) With A Best Of 6.63 @ 215 mph. Not Bad For An Almost 2700lb Door Car! All Of This Performance Accomplished With Our Mild Base Tune-up Intact! 4.500 Bore 525" 540" 557" 572"